"This venerable edifice, which is dedicated to St. Peter, is of very ancient foundation, but little now remains of the original structure except the western porch and part of wall. "It is 1218 years since the pious servant of Christ, Biscop surnamed Benedict, began to build a monastery in honour of the most blessed Peter, the chief of the Apostles, on the north side of the mouth of the Wear. The venerable and devout King of Northumbria, Ecgfrid, gave him a site and helped him in the work." That is what Bede tells us. The church has undergone frequent repairs and alterations. Towards the close of the eighteenth century, lamentable want of taste was displayed in the removal of the thirteenth century arcade, and in the erection of unsightly galleries. In 1875 it was carefully and intelligently restored, in a style more in harmony with and more worthy of its rich historical associations. 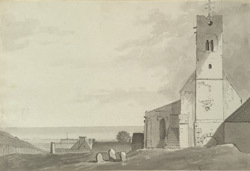 The church as it now stands may be described as consisting of nave, chancel, north aisle, with short transept and north porch". Extract from 'History, Topography and Directory of Durham', .